I want to start off by saying, I LOVE THIS BOOK and this method! I started reading the book, but decided to listen to the audiobook version free through my library. It was easier to listen to it in the car. And the book is a little repetitive, so it kept me focused. But the motivation from this book is seriously life-changing. It has been helping me get my house in order. Here are my thoughts on the books, but please join in with comments on how it's helped you or what is holding you back from tidying up your space! First, I have to admit that I'm not totally done with my tidying process. I've finished a couple categories, but I still have a lot of work to do. Part of my problem is that nothing in my house has a home yet. We are still working on getting things organized and figuring out what is best where. I wanted to use the KonMari method to help get the amount of stuff under control, so organizing and putting things in their place is possible. 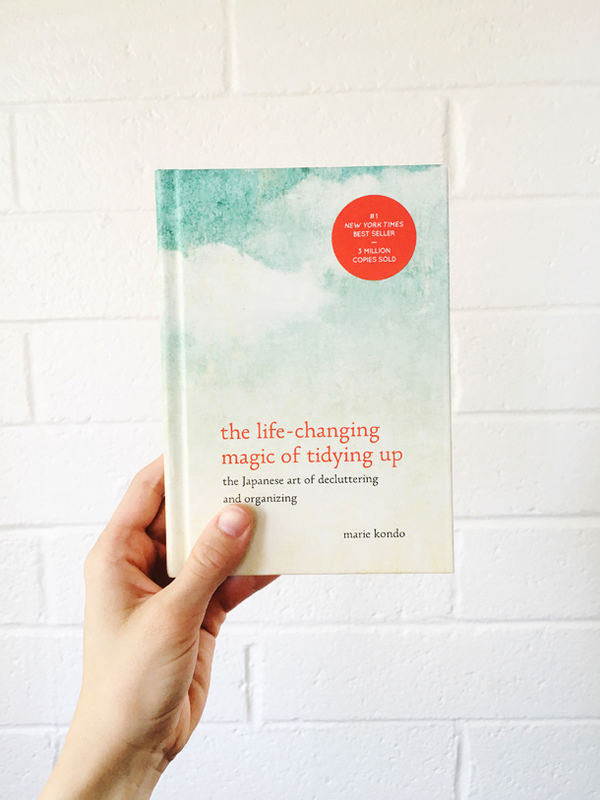 What I love about this book and the KonMari method is that it tells you to hold every item in your hand and ask yourself if that item sparks joy. I like this, because it doesn't tell you to get rid of the shirt because you already have three like it. If you like plain grey t shirts and they make you happy to wear them all, by all means keep those shirts and wear them proudly (anyone else have a gray shirt collection??). I like that it doesn't ask you to keep all your clothes on hangers and turn the hangers around and in a year, get rid of the ones facing backwards. If you don't love that piece of clothing, get rid of it now! Not in a year. I like that it's an effective program to make dramatic change all in one go. It doesn't stretch the process out over a year. It helps you make change to your life now and to only be around items that make you happy. I've successfully finished sorting and discarding books that I no longer want. I've gotten rid of most of the clothes in my closet and I'm now only buying things that make me happy to wear. And I've shredded and recycled more papers than I'm proud to admit. The amount of old paycheck stubs and school papers I had was insane. I had paycheck stubs from 6 years ago! There is no reason to store those. A really helpful tip from the book was to get rid of the warranties and manual for things. They come in so many products and I still has ALL of them. Kondo points in the book that by the time you'll probably need the warranty for an item, it will probably be expired and all the manuals for almost all products can now be found online. I know how to work my iron and I'm probably never going to need to read the instruction manual. Throw it out. I threw boxes, manuals, and papers in the recycle. I shredded anything with personal information and recycled that properly. If you're going through papers, please recycle! Look up the proper way to recycle shred in your area and recycle that as well. Some places might even have free ways to get rid of your shred. In Phoenix, you have to put all the shred in a clear plastic bag in your recycle bin. If you have questions about recycling, call you local city departments to find the correct way. Unfortunately, the day I was going to tackle the kitchen, our basement flooded. Tidying up has temporarily been postponed while we get that mess cleaned up. Surprisingly, the flood helped for two reasons. It showed me how important keeping things tidying are. And it helped us clear out A LOT of stuff. Had things been tidied up, we would have had an easier time figuring out what was down in the basement and would have made cleaning up easier. It also helped by forcing us clear out A LOT of stuff. It might not have been the way we wanted it to happened, but we were forced to make a decision on what we want to replace and we want to get rid of. I'm excited to continue tidying both the upstairs and basement. I feel like for someone my age, I have accumulated way too many things. I don't want to be surrounded by stuff. I don't have to live in a storage unit. I don't want my life to be about things. I only want to have items that I love and use and create a happy, comfortable space. Have you used the KonMari method to tidy your home? What are you thoughts? How long ago did you tidy and have you kept it that way? How did you get others in the home to participate in tidying? If you haven't, is it something you want to do? If so, what is holding you back? I'd love to hear what you thought of the book and the method it describes. I think I need to look at this book. Im currently in the process of moving in with my boyfriend and I have stuff at his flat, my flat and my parents house – half of which I probably dont need. And the word hoarder keeps getting thrown around…Im going to try and keep “if i dont love it, get rid of it now” in my head as I go through my clothes.